Planning a few days or a few weeks away with the kids can be really exciting for both parents and children. 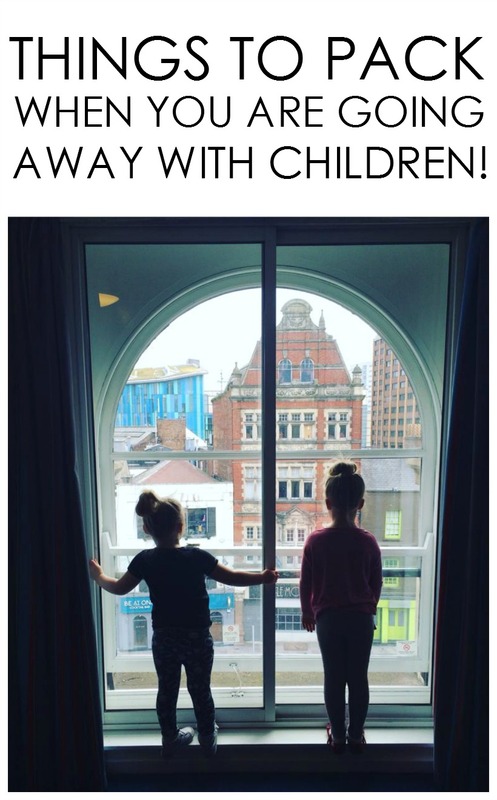 When we told the girls that they were going down South Wales for a couple of days they got super excited and when we told them we were having an extra night at another hotel they got even more excited. But before the excitement we all have to do that boring bit which is, the packing! When you go away from home you need to be sure that you have everything that you need. Some things you can buy from a shop (if you are near any shops) if you do forget something but it's always best to write a list of the things you need and tick them off once you've packed them. This way you save money and you've made sure you have everything. When you have children it's always a great idea to pack extra clothing for yourself, the children and anyone else who is going away with you. You may need to pack a little extra for the kids though. Kids can get messy, dirty and may sometimes have the odd accident. Depending where you are going it may be best to pack some suitable clothing for the activity you have planned. If you are going on a long car, bus or train journey you could pack some comfortable clothing for the kids and yourselves. If you child has a favourite teddy, toy or blanket remember to bring them! You will sure regret it once you've arrived at your hotel. Be sure it is at the top of your list. Sometimes in a new bed and new place it can be quite scary and unsettling for some children. If you are in a long car, train or bus journey you could pack a bag full of activities for the kids to do whilst you're on the journey and to keep them busy and occupied. Even at the hotel they can get bored but making sure they have something to is always a bonus. You never know what the weather is going to be these days. Even the weather forecast can be totally wrong. If you pack all clothing and other things suitable for all weathers it's one less thing on your mind. On your journey to your destination you're child may feel pretty hungry or bored! Remember to pack some snacks and drinks for your little ones to have on the way down instead of having to stop at shops all the time. You can use a travel potty for children who have even stopped using potties. Usually when you are on a long car journey there aren't many places to stop for a toilet and kids need to go when they need to go, don't they? The travel potty can be a great idea. Bringing your phone is quite important incase an accident happens and also to let your family know you have arrived safely. Bringing your camera can capture many memories and also remember to bring your chargers in case any battery goes flat.